From 1926 to 1929, when the United States Highways were designated with numbers, U.S. Route 52 in North Carolina was not one of them. Highway 52 is a two-lane mountain road entering the state at a 3,000-foot elevation from the north at the mountainous Fancy Gap, Virginia. Route 52 later becomes a four-lane roadway where it flows into the more level terrain from Andy Griffith's Mount Airy to Winston-Salem. In 1948, Route 52 was officially named a U.S. Highway. Odd-numbered highways usually run east and west and although Highway 52 sports many twists and turns, it is designated as a north/south route in North Carolina. As it curves to the east/west in other states it is named as an east/west route. Route 52 traveling north with Pilot Mountain ahead. 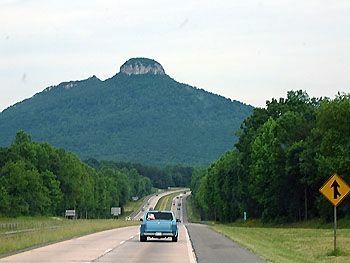 In the 1960s U.S. 52 was finished as a freeway between Mount Airy and Pilot Mountain. In the 1970s it was upgraded as four-lane freeway all the way to Winston-Salem. At Mount Airy, Interstate 77 Southbound continues due south while Highway 52 curves slightly to the east to Winston-Salem. For motorists traveling to points east on Interstate 40 from Winston-Salem, exiting at Mount Airy provides a shortcut, although travel-time through downtown Mount Airy is slowed by traffic lights. Now, however, the recently constructed Corridor 74 connects to Highway 52, bypassing Mount Airy altogether. This saves travelers 20 to 30 minutes as they avoid traffic signals, traffic and other factors that slow city traffic flow. 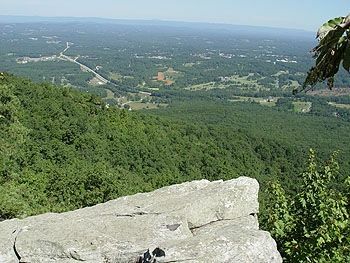 Route 52 as seen from the top of Pilot Mountain. Photo by Dale Longfellow. From a mountain two-lane road north of Mount Airy to the meandering four-lane that offers spectacular views of Pilot Mountain rising 1,400 feet above the wide-open, Piedmont countryside U.S. 52 offers a safe, convenient and scenic drive for motorists.